“VAMPIRE!” a curiously-loud member of the crowd yelled out after Jason Isbell & The 400 Unit walked out onto the main stage of the Old Settlers Music Festival Friday (4-12) in front of a full crowd to perform a rare acoustic set. 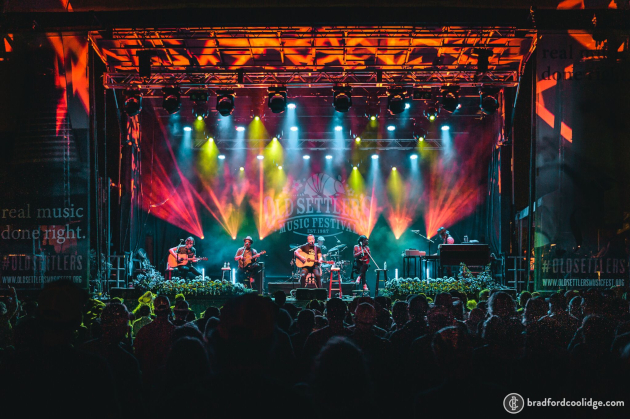 Instead of a half wall of amplifiers with their glowing power indicators bisecting the Old Settlers stage, four stools and microphones were placed across the front for what promised to be a more intimate performance of the King of Americana’s award-winning songs. 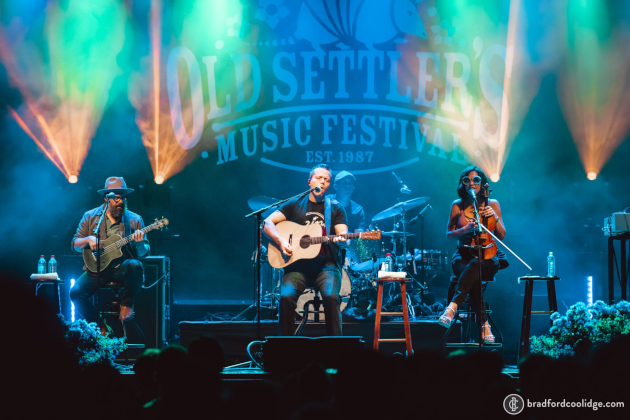 Though some Jason Isbell fans may have balked at the idea of not getting the full, roaring version of The 400 Unit live, at the 32nd Annual Old Settler’s Fest with its legacy of birthing import roots contributors to the community like Sarah Jarosz, it seemed even more appropriate than the electric alternative. 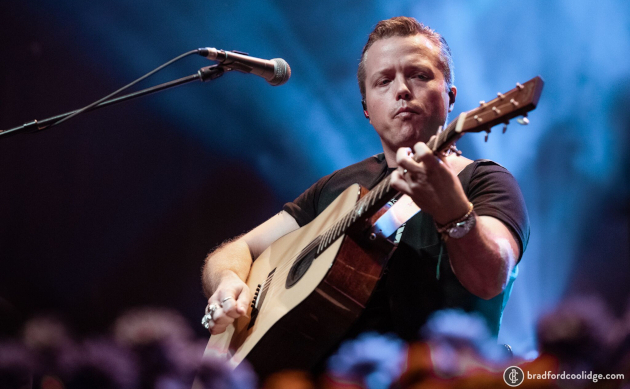 It gave fans of Jason Isbell an opportunity to see him in a way few have. 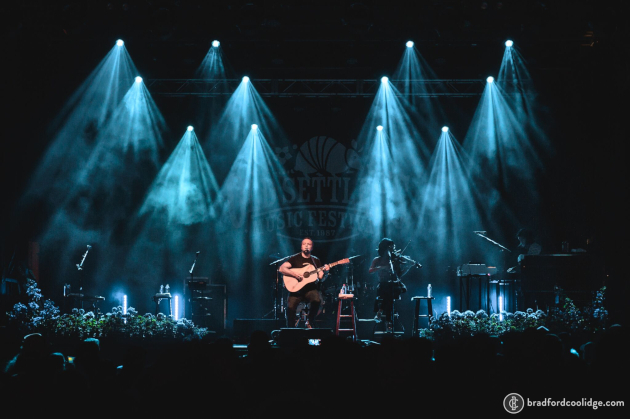 Logistical difficulties would have made it near impossible for Isbell to play the festival with the full 400 Unit rig, but he still wanted to make the appearance in 2019. So the idea of doing a mostly-acoustic show was hatched, and the festival’s Friday night headlining set was a success. 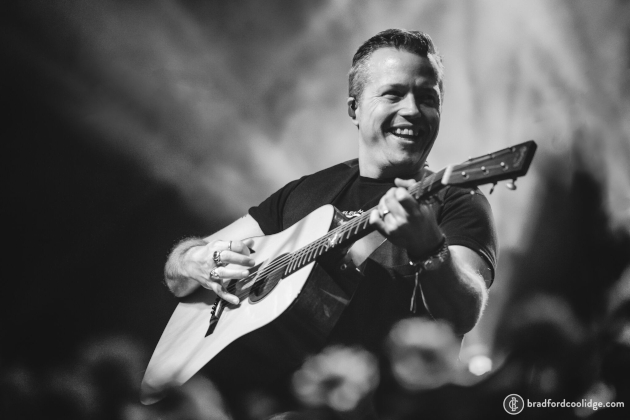 Along with Isbell playing his own custom acoustic Martin guitar model, guitarist Sadler Vaden played both six and twelve string acoustic guitars, and bass player Jimbo Hart played a tiny, ukulele version of an acoustic bass. Drummer Chad Gamble played as well, but kept it mostly to brushes and simple rhythms, while keyboardist/accordion player Derry DeBorja was the only member with a full rig. Amanda Shires joined the boys on fiddle too after playing her own set with her Nashville-based band earlier in the day. Aside from the few acoustic songs Jason Isbell regularly plays during his sets, the show gave fans an opportunity to see and hear unique versions of many of Isbell’s songs live. He did an epic fade out on “Last Of My Kind,” and singing with Amanda Shires on “Traveling Alone,” you couldn’t imagine a better arrangement. Though it must be fun for Jason Isbell and the boys to get loud, you could see a scenario in the future where Jason Isbell and the 400 Unit could play an entire tour in this capacity and pull it off. “I don’t have a hit song, but I have a song that played a hit song in a movie,” Isbell said while introducing “Maybe It’s Time” near the end of the set—a song that was one of the most recognized from the recent A Star is Born remake starring and performed by Bradley Cooper. Then Isbell played the Grammy-winning “If We Were Vampires” to close out the set, and indeed, everyone was happy. Photos below by photographer Brad Coolidge. Brad can can be found on Instagram and Twitter. Stay tuned for more coverage on Old Settler’s Fest from Saving Country Music, and you can also follow on Instagram. Please tell me there’s video of his set? There are a few vidoes on youtube. Just look up Jason Isbell Old Settlers. The A Star Is Born song is titled “Maybe It’s Time”. I’m very jealous you experienced this show. I have to eat massive crow about Ashley McBryde and Maddie & Tae. Pretty much all I’ve been listening to lately for the last couple weeks, and I’m not sure what my ears weren’t hearing at first, but boy was I dumb. Out of curiosity Boots, what M&T have you been listening to? Help me before the new EP comes out. Honestly, all of the stuff they have available!!! On Spotify, there’s a playlist they made with the whole Start Here record, some singles they’ve released since, and a comp track or two. I’ve always been listening to their live acoustic versions of songs on youtube that blow me away. Then i started checking out the new songs they performed but haven’t recorded (or at least released) yet, and so many of those are great, too. “Blame It On The Tree” is one of my favorites from that lot. Up until a couple weeks ago, i had only heard Friends Don’t and Die From A Broken Heart, and i liked them, but i didn’t hear how they were all that country, but my god, i was wrong. Those girls are poppy as hell, yes, but their songwriting is country, and quite good. I’m a huge fan. I’m actually upset that it’s just gonna be a new EP with 2 songs i haven’t heard (well, recorded, anyway) Like Trig said in that recent post, i want a whole album! It’s time! It was an incredible show! This was my 4th time seeing them. He did Outfit. Sonofabitch. Last three I’ve seen him he hasn’t done it. And one of those was on a Father’s Day weekend. And I always want to hear that song. Sounds like a unique experience. Although, I wouldn’t exactly describe Isbell or the 400 Unit as ever being “roaring”. Isbell is far too tame for that adjective. He doesn’t have a “roaring” bone in his body. He doesn’t have a “roaring” bone in his body. I don’t agree. Having seen them several times, I’d say they do roar at times. Usually, it’s on his DBT songs or covers. Of course, with each new album of originals, he plays less of those old DBT songs. Used to be five or six and now it’s maybe a couple at best. Thanks for the coverage. I wish I could have been there. Couldn’t have been more happy to leave this tame, polished set to hop over to Mandolin Orange after 3 songs. They put on one of the best shows I’ve seen in a long time. Love Isbell but nothing is going to surprise me at this point after seeing him a few times over the last 5 years. I think I would have liked to see this acoustic set, but I know where you’re coming from in general. I saw him for the sixth time in five years last June. It was good, but a bit samey. 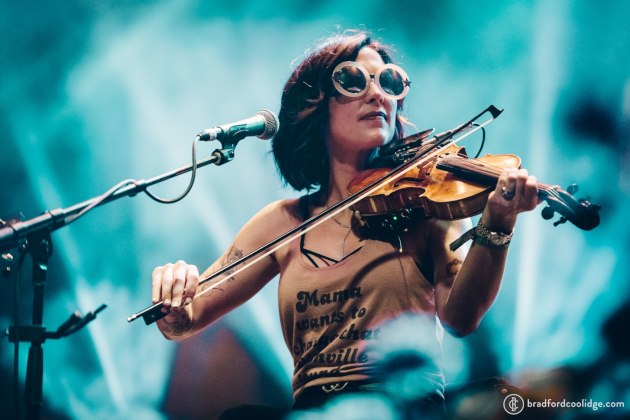 I saw Amanda Shires a couple of months later and enjoyed that one much more. Ths time, anyway. It was exciting and she was much better (full band and more focused) than when I had seen her a few years before, I’m passing on Isbell this time around and will probably check him out agan when he tours on a new album. Mandolin Orange really surprised me. I’ve seen them a number of times, but they brought the energy like I’ve never seen before. Has anyone found a live recording of this? I saw a couple mics set up in front of the soundboard. I couldn’t get up there to ask where/if they planned to post the show. I would be all for an Acoustic tour from Isbell and the 400 Unit. Seen them live a few times and it is a great show but the acoustic songs are the best part of the show normally.